OK, all of us have probably heard of the amazing Instant Pot by now! Many of us own one, and have used it successfully. Then there are those of us who have one still sitting in the box, since, oh maybe Christmas. Raise your hands. Be honest. I’ll admit I am just as guilty. Even worse I made my son test it out first and then give me a tutorial. CHICKEN! Anyway I got brave and tried it out for myself. 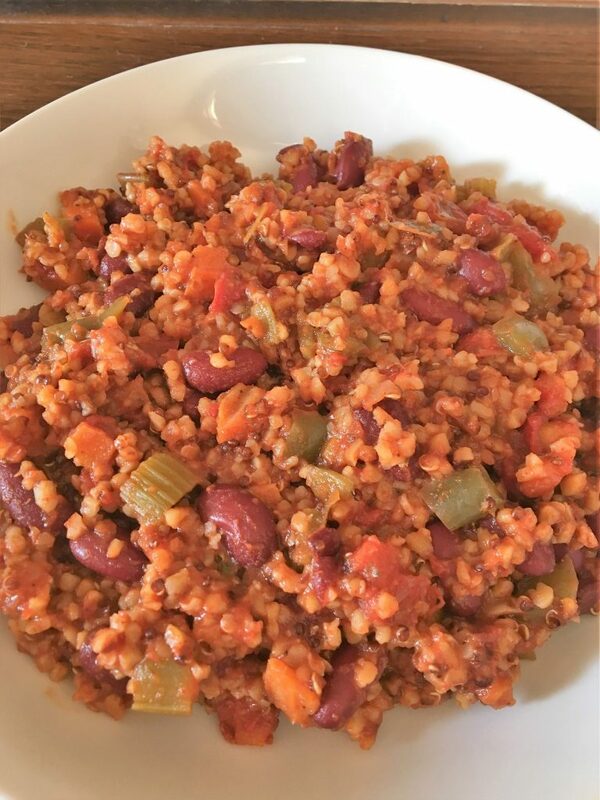 Even better, I have been wanting to share this awesome recipe for Vegetarian Chili with you that I first had at my sister’s house. It comes from a collection of recipes from the Moosewood Inn in Ithaca, New York. 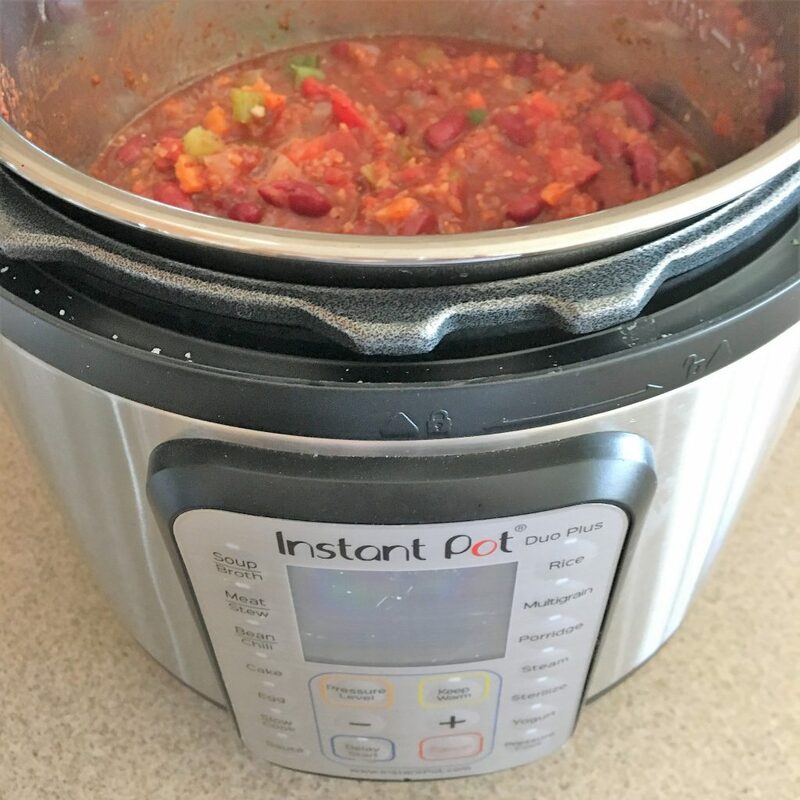 It is so delicious and packed with great ingredients, I decided to adapt the recipe for my Instant Pot….a definite win-win! 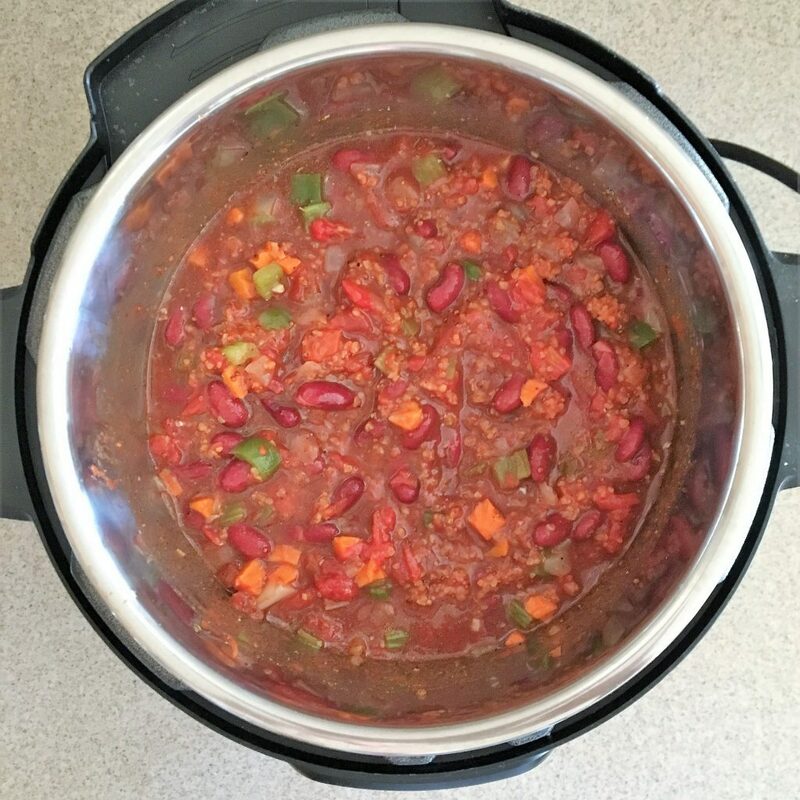 So, here you have it, worry free, simple to make, flavorful and healthy, Instant Pot Vegetarian Chili! 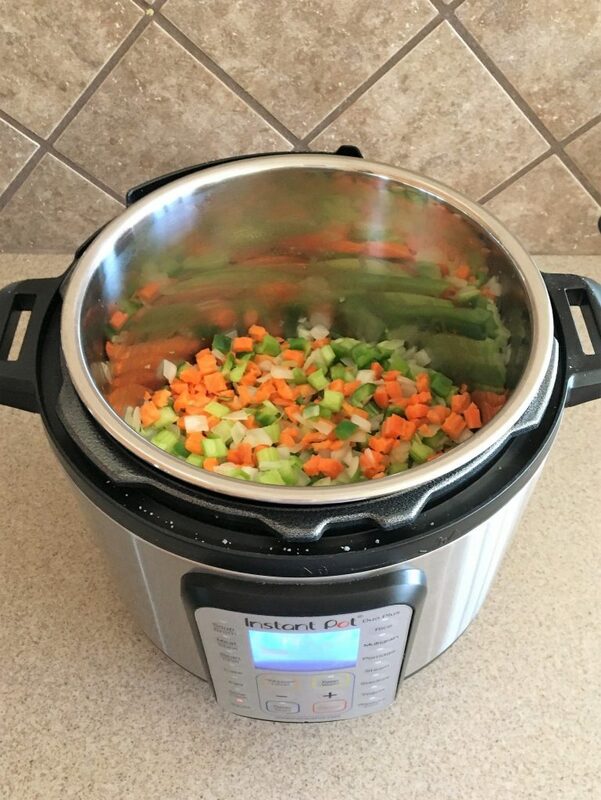 I am going to take you through the steps, quickly and easily, so you too will feel totally confident using your Instant Pot. What make this recipe so great when you marry it with the instant Pot is that you can perform all the steps with this one great appliance…sautéing, slow cooking techniques, pressure cooking, and even the capability of keeping the Chili warm until you are ready to eat it. So, first step in making your Instant Pot Vegetarian Chili is to place all the beautiful chopped veggies in the pot with the olive oil and cook them by pressing the Sauté button. I cooked mine for 8-10 minutes, but you can adjust the time, up or down depending on how soft you like your vegetables. Next, all you do is add in the rest of the ingredients. 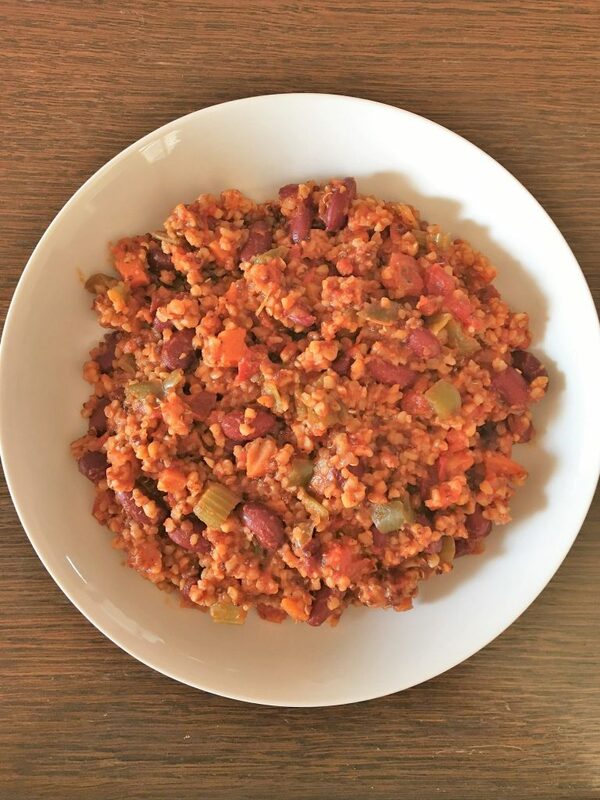 The bulgar gives the Instant Pot Vegetarian Chili a “meaty” texture, the beans give the chili body, and all the wonderful spices come together to make this chili taste like any meat version you have tried. After, all the ingredients are in the Instant Pot, simply place the lid on, lining up the arrows on the front and carefully locking it in place. 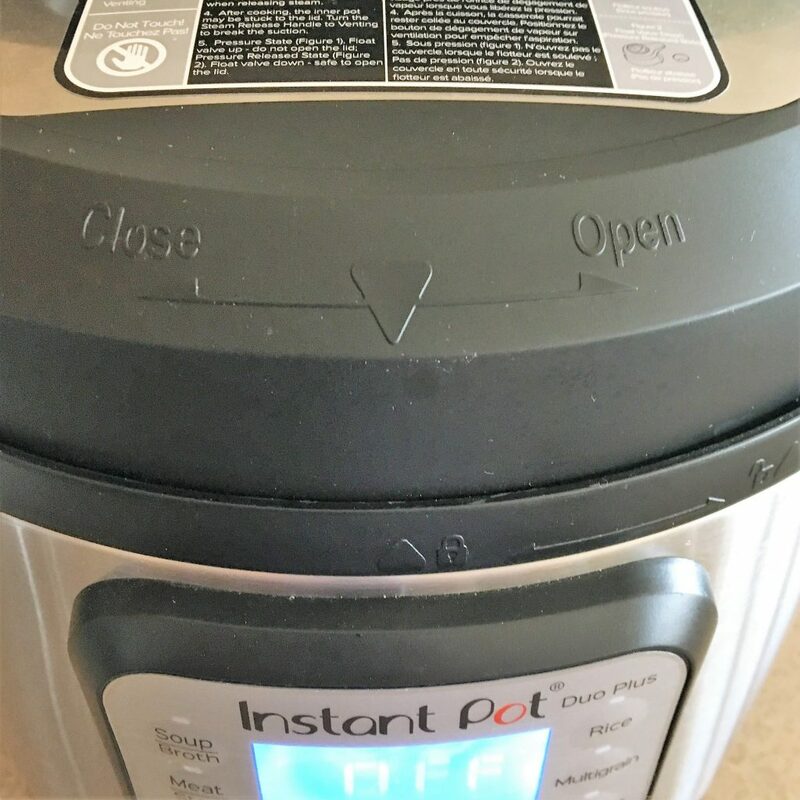 This is one of the features that I am very impressed with on the Instant Pot. Many other pressure cookers I have tried, the lid was so difficult to line up and lock. This step is so important not only for beginning the cooking process, but also for the safety when using the Instant Pot in pressure cooker mode. 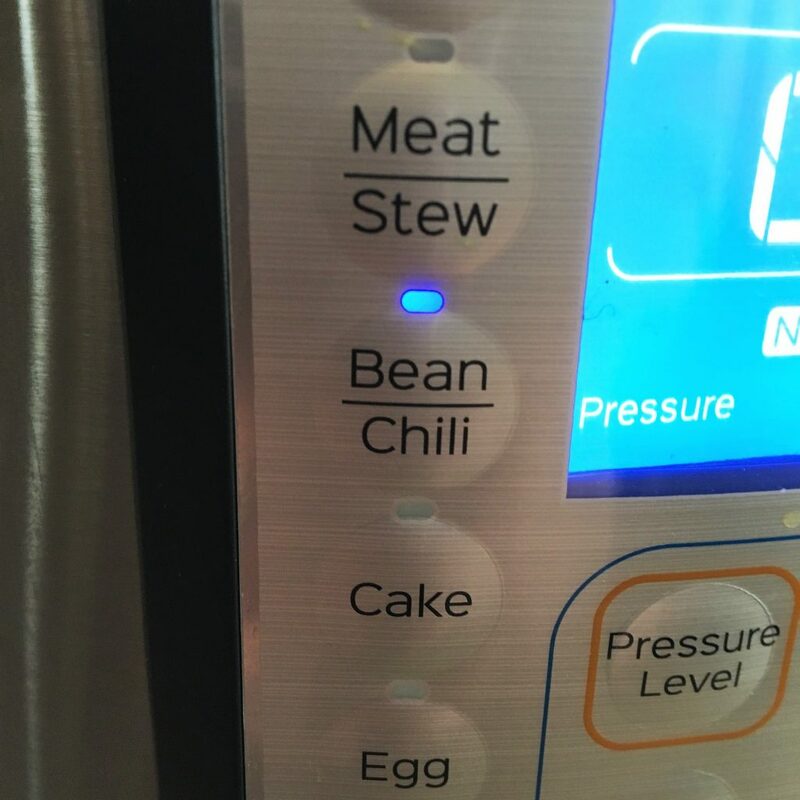 Next step, simply press the Bean/Chili button and let your Instant Pot Vegetarian Chili cook to perfection for 25 minutes. The Instant Pot will display an “ON” light while the chili is cooking. The beauty of pressure cooking is that it saves you a lot of time, but still produces all the rich taste you get from food that is cooked in a slow cooker all day long. Now, probably the step that concerns most cooks when using the Instant Pot is the pressure release. Well, I am going to give you some tips for this one. First, even before you read my tips, read your Instant Pot User’s Guide. Super easy to follow and great pictures that spell out the instructions. Next, and take this to heart, DO NOT OVERFILL your Instant Pot. There is a Max Fill line on the inside cooking liner…Simply do not fill ingredients above this line. Beans also expand some during cooking so you may want to stay a little below the line. Finally, be careful when releasing the pressure…do not get close to the vent and use a small towel when holding the release. Super easy! You have the option of Quick or Natural Pressure Release. There are great tutorials out there that walk you through this step, if you are still a little nervous. The Natural Release will slowly decrease pressure after the cooking cycle is complete. You don’t have to touch anything. The Quick Release is exactly that. By turning the Pressure Release Valve to Vent, you will let the pressure out in a few minutes. The whole idea of using a pressure cooker is to cook foods quickly and still retain all the moisture and flavor of slow cooking. The long wait for the Natural Release, about 20 minutes, seems counterproductive. But, if you have the time, use it until you are comfortable using the Quick Release. The main trick to not having any disaster stories is, again, to not overfill the pot. 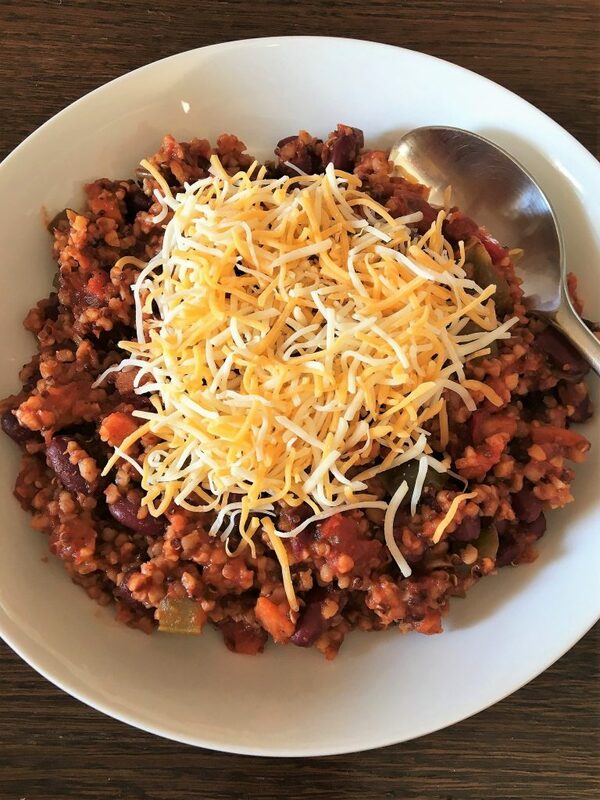 Now, that the cooking process is done, your Instant Pot Vegetarian Chili will stay warm in the pot until ready to eat. You can garnish your chili with cheese, sour cream, green onions or extra hot sauce. You will be amazed at the taste of this chili and I bet you won’t know it’s vegetarian. I tried this recipe on the military troops at the USO. I asked them what was missing from the chili. Most of them did not even guess the meat. True story! So, have fun getting to know your Instant Pot while enjoying this chili for any Tex-Mex dinner or celebration. Added bonus…it’s good for you! So, here’s to making Healthy Memories in YOUR memorable kitchen! Heat tomato juice for 1 minute in the microwave and pour over bulgar wheat. Cover with plastic wrap and let sit for 15 minutes, or until wheat is soft. Plug in the Instant Pot. Press the Sauté button. Heat the the olive oil and add the onion and sauté for a minute. Add the carrots, celery and peppers. Sauté for 8 minutes till vegetables are tender. Add the garlic and cook for 1 minute more. Add the beans, tomatoes, lemon juice, tomatoes paste, salt and pepper, and all the spices. Taste and adjust spices for heat. Add the bulgar wheat and taste again. Place the lid on Instant Pot base. Line up the arrows and lock in place. 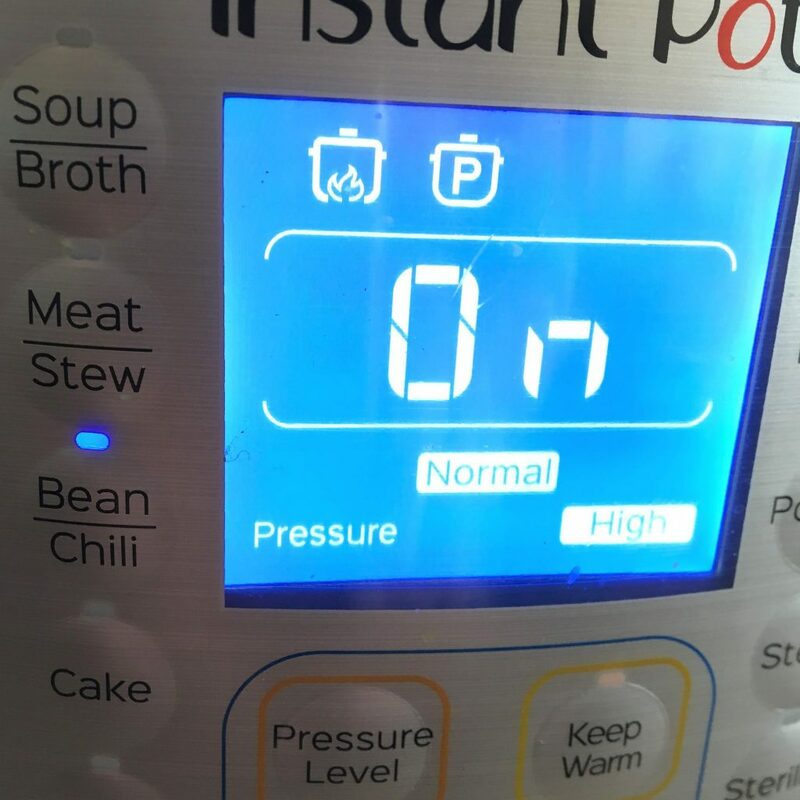 Press the Bean/ Chili button on the Instant Pot and cook for 25 minutes.